Ocean View! Indoor Pool! Spring Break and Easter Available...Great reviews!! WELCOME!! Have an Awesome Vacation....Casamer- At The Myrtle Beach Resort! Please Enjoy our Comfortable condo..Located in the OFS section of the Resort- The 'B' Building with the Indoor Pool. We have recently upgraded the condo with fresh paint, new Flat Screen HDTV's, New Dining room set and new flooring and bathroom vanities. Please take a look at our new pictures. For your Convenience, the Beds are already made up! Ready for your family to Start your Vacation! Our spacious 'Caribbean Get-Away' is located on the 4th floor in the Atrium Building of Myrtle Beach Resort. Our unit now beautiful Tile floor in the Living/Dining area, Kitchen and Hallway. For your comfort, there is a Queen, Sleeper sofa with new foam mattress, in the Living room along with a 42' HDTV. This two bedroom, two bath, SMOKE-FREE condo will be your 'home-away-from-home' the minute you enter. Comfortably furnished and recently painted. We offer a Queen Bed in the freshly painted Master Bedroom, 2 Twin beds in the guest bedroom, a Queen sleeper sofa- with new dense foam mattress, fully equipped kitchen, and 2 baths. 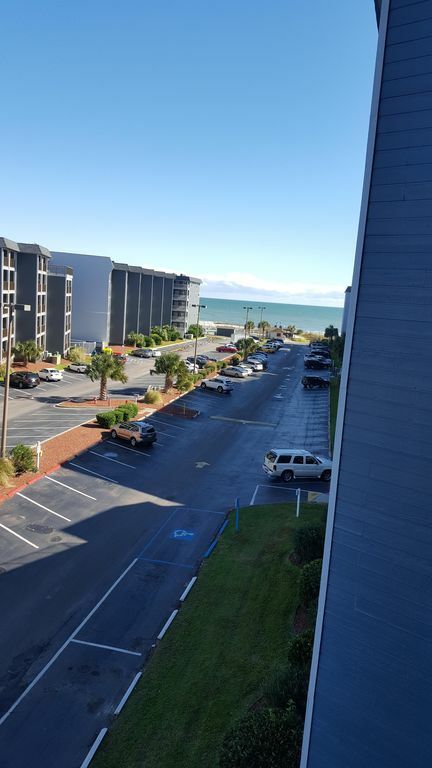 When you awaken in the morning you can enjoy your morning coffee on the Balcony with a View of the Ocean in Myrtle Beach. There are a couple of Bar tables and seating for your enjoyment. Or relax in one of our Adirondack chairs... If you prefer, you can take your coffee down to the beach! After breakfast, take a few strides and stroll along Myrtle Beach, play a round of Golf at nearby courses (15 within 30 min drive). One afternoon, do the 'Tourist things' near by at the Strand, play Miniature golf,or fish off the Pier. Then return to the quiet serenity this beautiful condo provides in Myrtle Beach Resort. After dinner, at home or a nearby restaurant, pop over to the ocean front Cabana bar (Seasonal), for some Live music by the ocean. Don't forget to take a late night walk along the Shore in Myrtle Beach. Beautiful!! Utilize the on-site pools and hot tubs, tennis courts, basketball court and Saunas. Cook on the grill by the playground. If per chance it rains, Swim in our Indoor pools or relax with a good book. Our resort has 24 hour security, elevators and luggage carts for your convenience. The Laundry room is located in the building. Best of all- THE LAZY RIVER AND WATERPARK!!! This area has the second longest Lazy River in Myrtle Beach, a Bucket Plunge area, and a wade-in pool for the little ones! Don't forget the big Kids- a large outdoor Whirlpool!! Remember when you book with an owner... You know exactly which unit you will be staying in...Casamer! Check out the resort's rates and add-on fees. Then book with an Owner for a Great Deal...Feel good about saving Money! You will want to return again and again to Casamer in our Gated Community in Fabulous Myrtle Beach!! NEW Myrtle Beach Law- On April 15th, 2015-A ruling was made by Horry County prohibiting tents year round on the beaches of Myrtle Beach, this includes a shade canopy. Umbrellas up to 7' 6' across are still permitted. We-the owners, and The Resort have no control over this new rule. Hello! The picture is my husband, Vince and myself- Julia, enjoying Myrtle Beach! I enjoy managing our property. We love to travel and have been able to do much more of it, since we have become Empty- Nesters!! I also Play Tennis, Plan our Neighborhood events, and Love visiting our daughters and hanging out with Friends and Family. We work hard to maintain our condo and every year we add improvements for our guests. We chose this Resort after a detailed search of Myrtle Beach. We had been vacationing in the Myrtle Beach area for a long time. When we moved to Georgia, it became feasible for our Family to purchase in Myrtle Beach. The Resort enables us to enjoy mini vacations, while letting us rent to others. It has been a great place for our Family Reunions. Because the Myrtle Beach Resort has so much to offer, it has made it enjoyable for me to manage. In the rental market today, there are fewer and fewer Owner-managed properties. Ours is one of them! We have a beautiful new dining set which can be used as a desk in the winter. Our condo is located in the Indoor Pool section. We strive to update our unit every year and keep it Affordable and Comfortable! One of our newest features is the new updated Memory foam Mattress on our sleeper sofa and freshly painted Living area. We also use a resort lock...so no keys! Parking passes are issued by Security upon check-in. ID required and number of guests registered. Plenty of golf and mini golf courses nearby. (2) One is in the exercise room in our Building The other is with the Indoor/Outdoor pool- for those who can't decide!! Elevators, Laundry Room on Site, 24 Hour Security, Family Resort ****Great Myrtle Beach Location! The condo was perfect for our April vacation. Everything we needed was either all ready there or right handy. The condo is in a wonderful location, with so many things to do and see in the area. Lots of in site activities. The condo was perfect for my mom, dad, myself and my 16month old toddler. Lots of pool and beach stuff available in the condo. Easy to check in and Julia and Vince were easy to work with. Great condo and location! Loved our stay! Loved the condo and had a great week at the beach! The resort and the location with all the pools and other amenities were great. This building had the indoor pool and it was great when it rained. The decor was perfect and they had brand new couch and beach chairs for the season. Vince and Julia were great host, they had extras like soap, toilet paper and other necessaries. If there was a problem they responded immediately. My only issue was mother nature and the cold weather and rain during our week. The extra touches with: a cooler, beach umbrella and chairs, water toys, books and board games were great. We would love to come back and stay here again. Very positive experience. And I will say a bad day at the beach beats a good day at the office! It was a little bit of a struggle getting in because the code didn’t work but Julia and Vincent were very responsive to me when I called. They got us in and the condo was extremely clean and homey feeling. WiFi connection wasn’t the greatest but I feel like it was because they are open networks versus password protected. Perhaps going to a secured network would work better? But again Vince and Julia were on top of trying to resolve it for us to enjoy our stay. Understanding the Myrtle beach resort is a large facility, the condos range in updating etc so really online booking can be a bit tricky. This unit was clean and well maintained; and included all you need for the beach as well. Cooler, body boards (like 5 of them), sand toys, beach chairs, umbrella etc. So you don't need to pack too much. The tile flooring is nice, helped in overall cleanliness; and the appliances are newer. I would not hesitate to rent or stay in the unit again. Thank you for submitting a review. We are happy that you chose our condo and that it worked out so well for you and your family. We strive for our condo to satisfy our guests. Thank you for your recommendation and we look forward to hosting you again. My family and I really enjoyed our time here. The condo is very clean and the pictures are accurate. The owner was extremely helpful, kind, and easily accessible. The room was a short walk to the beach and my children loved the on-site splash park as well as the playground, which gave them a little break from the beach. I highly recommend staying here. There’s nothing about the experience that I could complain about. Thank you so much for staying with us! We are always so thrilled when our condo lives up to our guests' expectations! We are glad that you all had a fantastic time at The Myrtle Beach Resort! The condo was very nice and clean the pictures are actuate and up to date! We didn't use the indoor pool or hot tub but looked very nice. We loved the resort area, the pool was great, the pool bars as well as the karaoke nights. We enjoy staying near Surfside and this was perfect! The owners offer beach chairs, board and sun buckets! Love the ocean view and quick walk to the beach! Highly recommend and would stay here again! Thank you for taking the time to write a review. We love our Housekeeper! We are glad that you noticed our pictures are accurate. Thank you for your recommendation and we are happy that you enjoyed all that the resort and location had to offer! Our Weekly rates include Linens for the condo, the exit cleaning fee, and taxes. Rates are subject to change till reservation is confirmed. Rates may be higher during Holiday times. Please do inquire, there may be an unadvertised special. We also own a less expensive 1 bedroom unit, in the same complex. Please do us a favor and read all of the reviews, including those I have entered. Some of the Comments are by our previous, valued guests!